With many of the documents being hand written, and many in old scripts, it is inevitable that mistakes will be made in transcription. Even some 'original' documents are themselves transcriptions - e.g. Bishop's Transcripts of parish records, or books were usually transcribed from handwritten manuscripts. The names on this page wc can be fairly sure are incorrect versions of the true name. Context: First wife of Daniel S. BECHTEL of Grand Rapids, Michigan. 701 VI BECHTEL, DANIEL S., was born March 19th, 1842. He resides at Grand Rapids, Michigan. He was first married to Adaline Gilborn, and after her decease he married Mary . His family consists of seven children, namely: VII Harvey, VII Minnie, VII William, VII Herbert, VII Floyd, VII Clarus, and VII Earl. Adaline Gilborn has not been found on Familysearch in Canadian censuses of 1851 or ’61. Daniel & Adaline cannot be found in the 1870 U.S. or 1871 Canadian Censuses – did they move from Canada to the U.S. between the two censuses? The 1880 US census records the family at Caledonia, Kent, Michigan, U.S.A.. Daniel was a butcher. * Eby states that Daniel’s parents were Levi L Bechtel, born Montgomery Co., Pennsylvania, 2 Apr 1809, and Magdalena Schneider, born Bloomingdale, Ontario, 6 Dec 1806. In November 1894 Magdalena Schneider Bechtel provided Eby with ‘the names of all her children, grand children and great grand children, together with the dates of birth of each and dates of death of those who died; also gave him names of persons to whom each of her children and grand-children are married, and dates when such marriage took place.’ [p. 204]. Death certificate names his wife as Bridget CANTWELL. They married 17 Oct 1901 in Chicago. 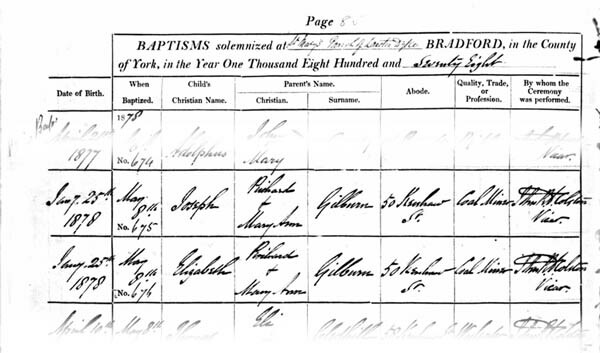 Context: Twin children of Richard and Mary Ann, baptised 8 May 1878.